Before you go traveling, it is important to make sure you have taken the proper steps to maintaining your health. The reason why this is so important is that other regions and countries will have different kinds of illnesses and bacteria. Your immune system will not be prepared and you can be left vulnerable to falling ill.
To ensure you can stay healthy and enjoy your trip, there are a few things to consider such as vaccinations and purchasing medication, which are both services Arkell Walk-In Clinic & Arkell Pharmacy can provide to you. As a walk-in clinic in Guelph, Ontario we are dedicated to meeting all of your health needs, at your convenience. Vaccination: Vaccinations are extremely critical; especially when you are going to regions or climates you have not been to before or have not visited in a while. For example, if you lived in a mild climate most of your life then you probably not faced illnesses such as dengue, which is very common in tropical regions. 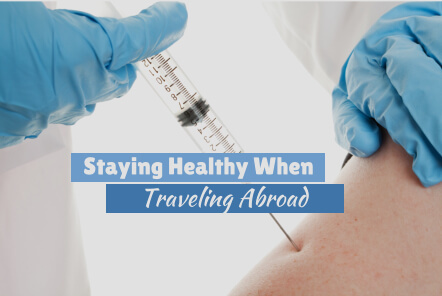 This is the reason why you will want to get vaccinated before traveling abroad. These illnesses can be very serious and they can leave you extremely sick, not to mention ruin your vacation. By vaccinating yourself you will be providing the boost your immune system needs to keep yourself healthy for the duration of your trip. Medications: Besides vaccinations, there are numerous medications you can take. These meds can be used to boost your immune system as well as battle any diseases you may actually get while traveling. Through our medical services in Ontario, we can help you get the proper medications and supplements. We can also provide you with advice and useful information that you can use to make sure you can keep yourself and your family stay free from illness while you are on your trip. Whether you are traveling for pleasure or business, do not let an illness ruin your trip. Through preventive measures such as vaccinations and proactive medications, it is possible to provide your immune system the help it needs to stave off foreign diseases. If you are interested in finding out more about the kinds of services we are offering, please feel free to visit our website at www.arkellmedical.ca today. This entry was posted in Medical, Pharmacy and tagged Medical Consultations, Medical Examinations, Walk-In Clinic. Bookmark the permalink.